The Stoptail Bridge itself is a work of art. It is precision CNC machined from aircraft grade aluminum and is available in the following colors: Natural Aluminum, Gold Anodize, Black Anodize. Choice of Polished or Satin finish. The saddles, screws, studs and stud wells are all machined from solid brass billet and left unplated for better tonal transfer. These are also available in Nickel, Gold or Black plating. MannMadeUSA sticks to its “no modifications necessary” policy with this new Stoptail Bridge. Just remove the original unit and install the new bridge. Set your string height and intonation, and you are ready to rock! With the new MannMade USA Intonatable Stoptail Bridge, there is no need for locking studs, because they are machined to exacting tolerances. 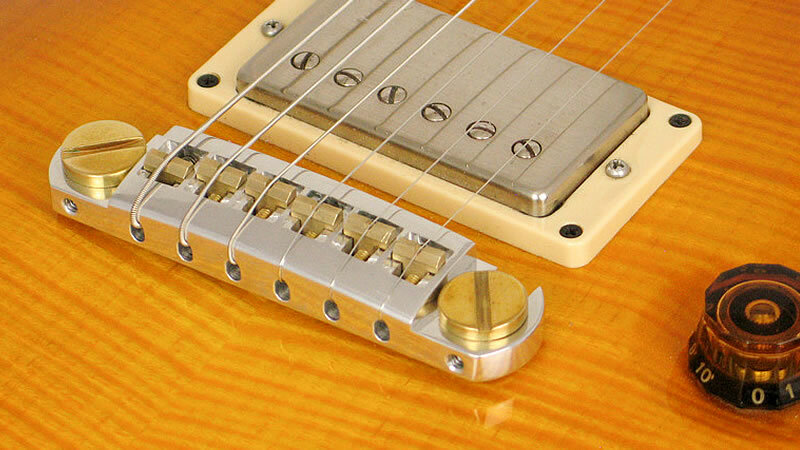 As a result, they couple solidly with both the bridge and the guitar, which improves tone transfer. Plus, they won’t flop around or fall off and ding the top of the guitar when changing strings. Get more information at MannMadeUSA.com. MannMade USA designs, manufactures and sells world class guitar and bass bridges, hardware and components for OEM guitar companies (original equipment manufacturers), small builders and luthiers, repair shops and to the general retail public. Their mission is to produce state of the art parts that improve upon original designs, yet retain original concepts. The design must improve tone, functionality, playability, feel and look. Designed and manufactured in the USA since 1985.